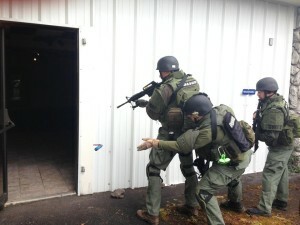 The Basic SWAT course is designed to provide law enforcement students with an understanding and application of Basic SWAT tactics, techniques and procedures during critical incidents. Students will be exposed to common SWAT missions such as High Risk Warrant Service, Barricade Persons, and Hostage Rescue tactics. The course will provide lecture and demonstrations with scenario-based exercises. Pre-requisite: Certified Peace Officers / Active Duty Military – This course is hosted based on current TCOLE Standards. There will be a pass/fail physical assessment the morning of the first day of class. Students should show up for class in PT gear -bring clothes to change after. Students failing the physical assessment receive a certificate of attendance rather than a certificate of completion. The PT test is the Cooper “Single Cut-Point” standard: 1.5 mile run in 16:28, 300 meter run in 1:11, 25 push-ups in 1 Minute, 29 sit-ups in 1 minute. Equipment: All normal tactical equipment including, BDU or other similar tactical uniform, PT clothing, body armor, load-bearing vest or web-gear, eye and ear protection, gas mask, handgun and/or shoulder fired weapon (400 Rounds Rifle/400 Rounds Pistol). Please bring Simunitions / UTM safety equipment and 50 Simunition / UTM rounds.